Henning Sigfrid Nilsson is Valinge in 1907. He wanted to become a violinist, and first practiced all kinds of jobs: farmer, tailor, luthier, violin teacher and antique dealer. It was at this time that he met the sculptor and ceramist Robert Nilsson Sign Persson Melin in contact with who he discovered ceramics. He then built with a friend a small oven and leads to the technique of glazure. 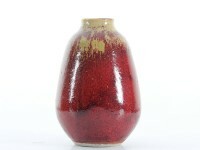 He trained and became a master in the work of "oxblood glaze". In 1954, he moved to the outskirts of Kullagatan in Höganäs, close to the Höganäs factory which he uses to burn his works. In 1967, when he was 60, he won the national art award.